This 30 minute DVD demonstrates how The Jesus Accounts are based on good evidence, significant ancient manuscripts, eyewitness accounts and much more. 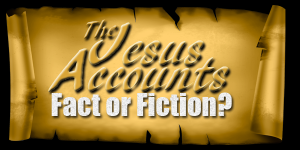 An opportunity to see how today's claims that Jesus accounts are distorted documents can be responded to with confidence. Click here to order. Or to view the entire film before purchase, please visit our Youtube channel. "I'm thrilled to see the production of The Jesus Accounts-it carefully examines the historical evidence and draws on the expertise of renowned scholars. It will prove a fantastic resource." On the web in multiple languages! The Jesus Accounts film is available on the internet in Arabic, Kyrgyz, Russian, Tajik, Turkmen, Bengali, English, Turkish, Mandarin, and Cantonese (subtitles), and more! Click here for full language list and links.